When it comes to the features which determine your bow speed, choosing the suitable arrow for shooting accuracy is important. Buying cheap or unsuitable arrows may negate many of the key features of your bow. Most bows contain similar features, so it is not so much in the type of compound ﻿bow you use to attain shooting accuracy. You will really find your edge while you had a wise use of arrows, both in the arrow manufacture quality and the materials they are made from. Let’s look at the uses of each type, and the pros and cons of each. When bows were first invented, wood is traditionally the material of choice. They are cheap, reasonably flexible, and durable. Wooden arrows are still used today and can be used for indoor or outdoor shooting. These are strong, lightweight, and fast flying through the air. Carbon arrows are mostly applied in modern bows which can operate by the lighter weighted arrows. Although pure carbon arrows are available, the most common kind of carbon arrow is arrow made from a mix of aluminium-carbon materials that gives the arrow durability and extra strength. Carbon arrows are shorter than aluminium arrows which give a greater speed. 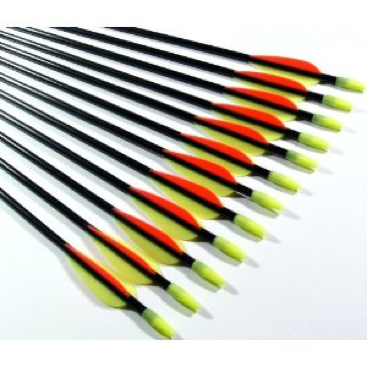 Carbon arrows maintain their shape well and used for long distance shooting. They are quite expensive, thus the downside to using it is in the price. Aluminium arrows are famous choice with indoor target archery. Many archers prefer the thicker aluminium shafts to the thinner carbon arrows. In archery tournaments, aluminium arrows are always the first choice. Beginning shooters are advised to use aluminium arrows because of their recovery once the target is missed. About the price, aluminium arrows are not as expensive as other types, so they can be easily replaced once damaged, lost, or broken. It’s also easy to replace the arrow tips and this allowing you to keep the arrows for a long time. What is better? Carbon or Aluminium Arrows? Are usually used as a training arrow, and are heavier than other materials. While they are more durable than wooden arrows and can be made to different of sizes to the archer needs, fiberglass arrows will break quite easily. Thus, aluminium arrows are more preferred. It is helpful that you know there are 4 arrow materials: wood, carbon, aluminium, and fiberglass. How they are applied in different applications. To choose which arrow material to buy you need to at the same time figure out the arrow length, arrow weight, arrow spine, which I mentioned below. Make sure the arrows you buy are straight, and suit the bow and your shooting needs. Choosing the proper arrow length was somewhat a complicated process with older compound bows. Nowadays, with advanced technology, things have become much easier. Once you have decided your draw length, just add 0.5″ up to a maximum 1″ to get an appropriate arrow length. So if your draw length is 29″, you should get arrows with a maximum length of 30″. The arrow length is measured from the deepest part of the nock groove, to the end of the shaft (not include length of broad heads). If you are in a target practice, the arrow weight you should choose around 5 to 6 grain per pound of draw weight (the weight of vanes, shaft, insert, nock, and field point combined). So if you have a bow of 70lbs. of draw, arrows you want to use are those weigh in total between 350 and 420 grain. If you are in hunting, the total arrow weight you should choose is in between 6 and 8 grain per pound of draw weight. It is not recommended and never you will do is to use an arrow that weighs less than 5 grain per draw weight pound, since this will damage your bow void your manufacturer warranty. Spine – is the arrow stiffness and the amount of displacement of the center point when it is launched. The amount of spine that an arrow has depends on the stiffness of shaft materials. Since Spine is the arrows stiffness, the lower the spine number, the stiffer the arrow is. That means a 400-spine arrow is more flexible than a 340-spine. A more rigid spine is usually required for faster bows, or the arrow will flex too much. Bows with light draw weights – slower bows, more rounded cams will impart less flexing on the arrow, and shoot best using a flexible spine arrow. Since the arrows you choose will make a difference in shooting accuracy and the bow speed. 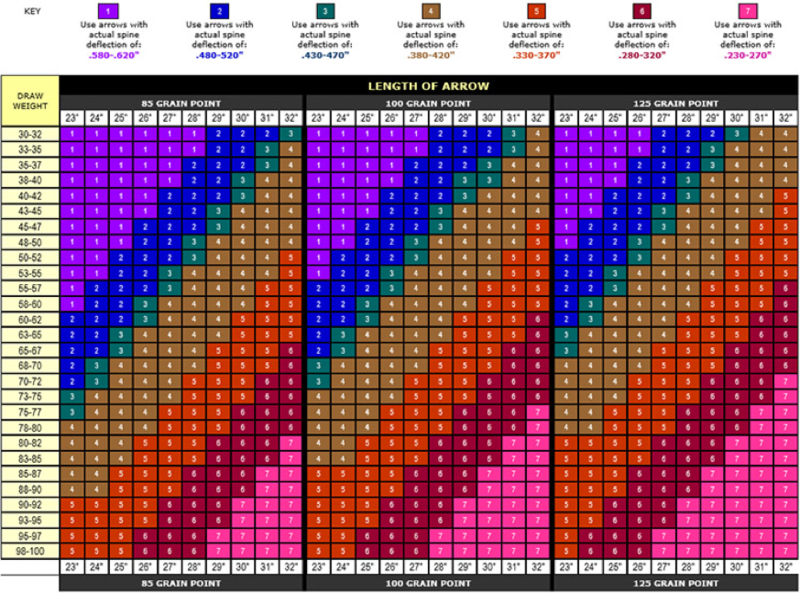 Therefore, to choose which arrow to buy, it is crucial to first find out what is your arrow length based on your draw weight; then depending on which shooting form to figure out an appropriate arrow weight in not less than 5 to 6 grain for target shooting or 6 to 8 grain per pound of draw weight for hunting. The lower the spine number, the stiffer the arrow is. Faster bows required stiffer arrows, slower bows with light draw weights will be shoot best with a flexible arrows or higher spine number.